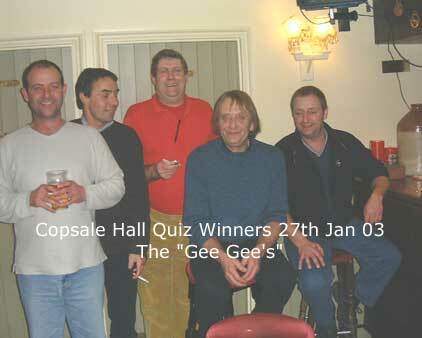 Around 40 people attended the quiz last night. A few more people than we expected. BJ had to cook some extra food which was very good of her as it was supplied free of charge. John Barratt was question master with the help of Duncan England holding him upright. The "Gee Gee's" were the surprise winners ( I was surprised anyway!) by a margin of 3 points which they managed in spite of Nick Holman getting an easy horse racing question wrong. They kindly donated their winnings back to the Hall fund and we made around £55 profit on the night.